← Just Like Starting Over: The Love Punch, reviewed. And now for something completely different, and completely intimidating — at least initially. The current issue of Air & Space/Smithsonian magazine has my first-ever astronomy story, about the James Webb Space Telescope, the remarkable $8.8 billion dollar replacement for the aging Hubble Space Telescope. As JWST orbits the Earth from a million miles away, its six-meter mirror of gold-coated beryllium will collect light that’s fainter, farther away, and billions of years older than we’ve ever been able to see, showing us some of the earliest objects that formed in the universe after the Big Bang. As with most of NASA’s flagship projects, JWST has taken longer and cost far more than NASA had said and Congress had hoped. It’s now set for launch in October 2018. You can read the piece here and its sidebar here. 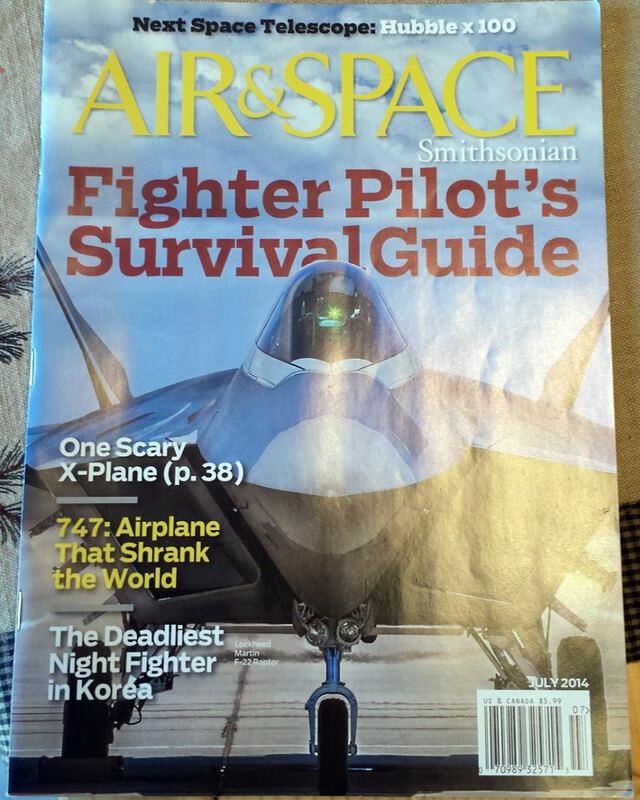 If you’re the old-fashioned type, or if you’d like to show your support by picking up a paper copy, the magazine will be available May 27 at Barnes & Noble bookstores and looks like the photo at left. I made several visits to NASA’s Goddard Space Flight Center in Greenbelt, MD while I was reporting the piece. One thing that struck me is how well-rounded the scientists and engineers I interviewed seemed to be. To cite my favorite example, Jonathan Gardner, JWST’s deputy chief project scientist and the director of Goddard’s Observational Cosmology lab, directed a production of Thornton Wilder’s Our Town for Goddard’s Music and Drama Club that I attended in February. I’ve never worked anywhere that had its own on-site dramatic society, but I support this. I’m grateful to my longtime pal Heather Goss, an editor at Air & Space, for believing I could report and write this story though I’d never covered astronomy or NASA before. It was a thing worth doing. And I was glad the story went to print under the title I suggested. JWST is an infrared telescope that’s going to illuminate the dawn of the universe. I regret nothing. 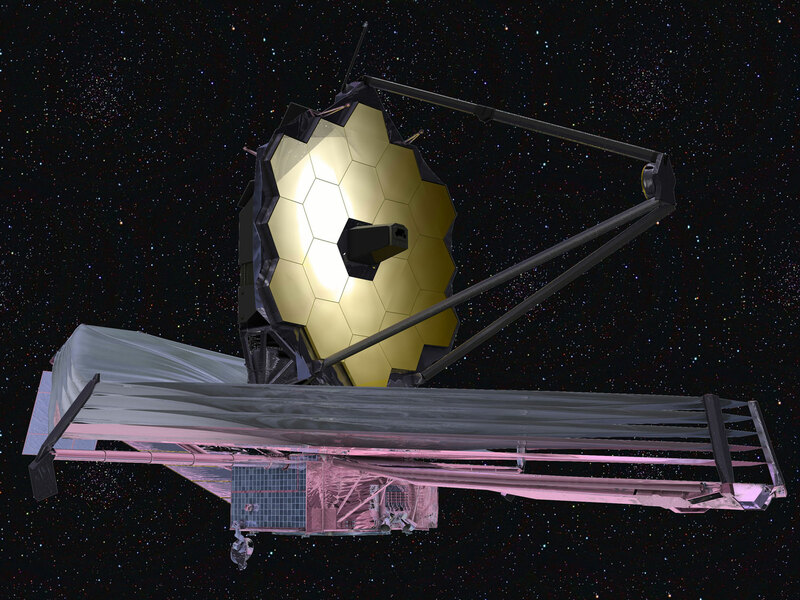 A 2009 illustration of the James Webb Space Telescope with its primary mirror and sunshield deployed (NASA). This entry was posted in science and tagged astronomy, Heather Goss, James Webb Space Telescope, NASA, outer space, Smithsonian Air & Space, space exploration. Bookmark the permalink.